Most of Egypt's gods, including many of the major ones, do not have significant roles in mythic narratives, although their nature and relationships with other deities are often established in lists or bare statements without narration. For the gods who are deeply involved in narratives, mythic events are very important expressions of their roles in the cosmos. Therefore, if only narratives are myths, mythology is a major element in Egyptian religious understanding, but not as essential as it is in many other cultures. 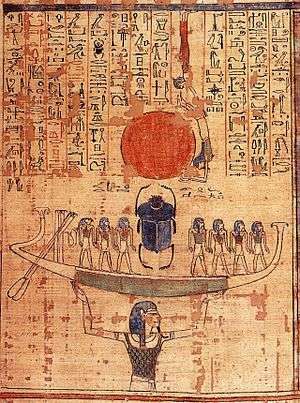 The Egyptian word maat refers to the fundamental order of the universe in Egyptian belief. 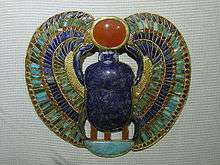 Established at the creation of the world, maat distinguishes the world from the chaos that preceded and surrounds it. Maat encompasses both the proper behavior of humans and the normal functioning of the forces of nature, both of which make life and happiness possible. 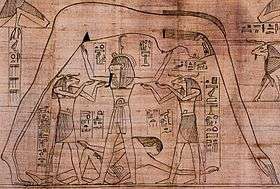 Because the actions of the gods govern natural forces and myths express those actions, Egyptian mythology represents the proper functioning of the world and the sustenance of life itself. ↑ Horus and Set, portrayed together, often stand for the pairing of Upper and Lower Egypt, although either god can stand for either region. Both of them were patrons of cities in both halves of the country. The conflict between the two deities may allude to the presumed conflict that preceded the unification of Upper and Lower Egypt at the start of Egyptian history, or it may be tied to an apparent conflict between worshippers of Horus and Set near the end of the Second Dynasty. ↑ Horus the Elder is often treated as a separate deity from Horus, the child born to Isis. Baines, John (April 1991). "Egyptian Myth and Discourse: Myth, Gods, and the Early Written and Iconographic Record". Journal Near Eastern Studies. 50 (2). JSTOR 545669. Meeks, Dimitri; Christine Favard-Meeks (1996) . Daily Life of the Egyptian Gods. Translated by G. M. Goshgarian. Cornell University Press. ISBN 0-8014-8248-8. O'Connor, David; Quirke, Stephen, eds. (2003). Mysterious Lands. UCL Press. ISBN 1-84472-004-7. Tait, John, ed. (2003). 'Never Had the Like Occurred': Egypt's View of Its Past. UCL Press. ISBN 1-84472-007-1.